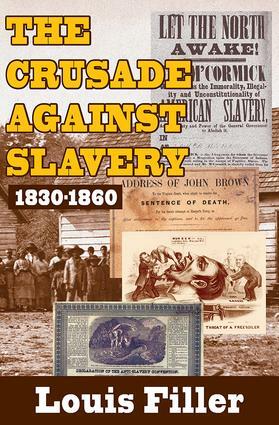 Perhaps no other crusade in the history of the U.S. provoked so much passion and fury as the struggle over slavery. Many of the problems that were a part of that great debate are still with us. Louis Filler has brought together much information both known and new on those who organized to defeat slavery. He has also re-examined the anti-slavery movement's ideals, heroes, and martyrs with historical perspective and precision. Contrary to popular belief, the anti-slavery movement was far from united. It included abolitionists as well as a variety of reformers whose activities place them among the anti-slavery forces. These included men as different in background and temperament as William Lloyd Garrison and John Quincy Adams. Portraits of the many protagonists, their hardships, and their quarrels with Southerners and Northerners alike, bring to life this exciting and tumultuous period. Filler also examines the many related reform movements that characterized the period: feminism, spiritualism, utopian societies, and educational reform. The volume traces the relationship of the antislavery movement to abolition and probes their connection with the several reforms that dominated the period. He brilliantly recaptures a sense of the contemporary consequences of the reformers efforts. This is an absorbing and important survey of the problems--political, social, and economic--that made this period so crucial in the history of the U.S.